With awesome scenery and close proximity to the year around resort town at Mammoth Lakes, the Ansel Adams Wilderness is one of the most popular wilderness areas in the Sierra Nevada. On any given summer day Thousand Island Lake is more aptly described as Thousand Person Lake. The reality is that Thousand Island Lake has far fewer than a thousand islands (actually only a few dozen) and most summer days people easily outnumber islands. However, the Ansel Adams Wilderness spans 231,533 acres and it’s remarkably easy to find solitude outside of the narrow corridor along the Middle Fork San Joaquin River, which includes Shadow Lake, Garnet Lake and Thousand Island Lake. I have visited the Ansel Adams Wilderness over a dozen times, each time venturing beyond the well-trodden path to visit remote lakes and peaks including Mount Ritter, Banner Peak, Clyde Minaret, Mount Davis, Rodger Peak, Electra Peak, Foerster Peak and Volcanic Ridge. The Ansel Adams Wilderness never disappoints! On this day I designed a loop that mostly features places I have already been to in the past (often multiple times), but it was amazing to combine these favorites into one aesthetic loop and see some of the best scenery in this region of the High Sierra. Starting from Agnew Meadows I headed down to the River Trail and then up to Shadow Lake in the pre-dawn hours. I timed sunrise nearly perfectly at Lake Ediza and then found a lovely tarn above the lake (marked on the USGS topo maps) to enjoy early morning light over the peaks and reflecting in the water, in the process taking over 100 photos in about 20 minutes! 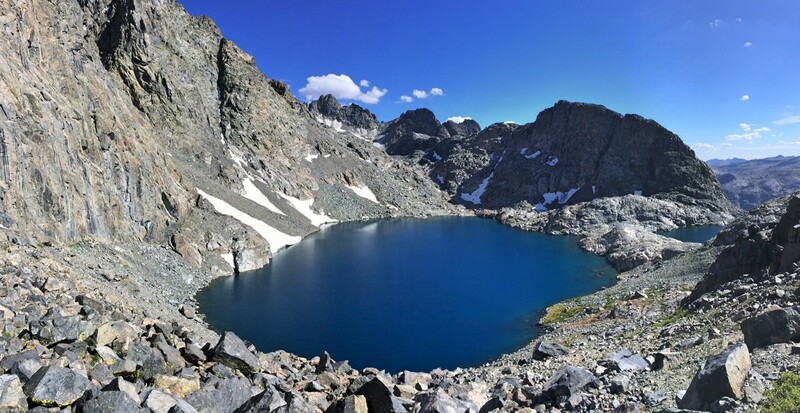 This tarn overlooks Lake Ediza for a tiered view and includes the Minarets, Mount Ritter and Banner Peak. From the tarn I continued up slabs and talus to Volcanic Ridge which is one of the best viewpoints in all of the High Sierra. The tremendous panorama includes the best view of the impressive Minaret spires. From the summit of Volcanic Ridge I headed down the southwest slope toward Minaret Lake and then toured the triumvirate of three spectacular lakes beneath the Minaret spires – Minaret, Cecil and Iceberg. Each of these three lakes is stunning and provides a different angle on the Minarets which soar above the lakes like sky scrappers. From Iceberg Lake I traversed the basin above Lake Ediza and then headed up through meadows toward Mount Ritter and Banner Peak. The meadows ultimately transitioned to talus, but I was pretty good at avoiding any loose rocks making for an efficient climb to the snow chute leading to the Ritter-Banner Saddle. The steep now chute required crampons and ice axe. From the saddle, Banner Peak is a short talus hop away and soon enough I was looking down at Thousand Island Lake and Garnet Lake from the high perch. Mount Ritter is more complex. Unlike the past two times I had done the north face route, the snow had completely melted off the ice requiring a semi-sketchy crossing of hard, steep ice in aluminum crampons to reach the ramp for the north face route. This proved to be the crux. Once I was on rock, I encountered no further difficulties on the enjoyable class 3 scramble as I have done this route twice before and I was soon enjoying the view from Mount Ritter’s summit. This might be the year the snow and ice completely melts off and crampons and/or ice axe are not needed for the chute or to access the north face of Mount Ritter. It’s unclear whether the underlying loose rock would actually make the route more difficult. After the summits of Banner Peak and Mount Ritter, I headed down to the Ritter Lakes via Mount Ritter’s west slope. The west slope route poses no technical difficulties, but it’s important to follow the route as it’s fairly easy to wander off into much more difficult terrain. The west slope essentially utilizes two bowls connected by a slabby ramp. Finding and using this ramp is the key. The west slope descent route deposited me at the Ritter Lakes were the only spot I had not visited previously. I had high expectations as I first became intrigued while looking at them from Mount Davis. 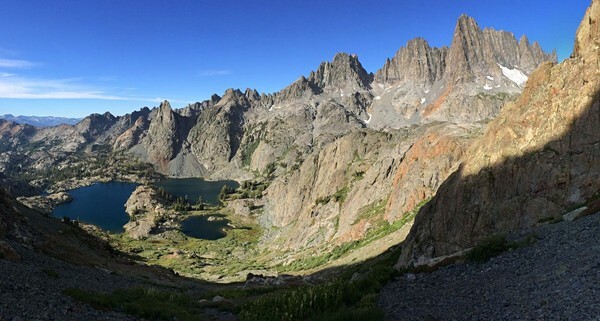 The Ritter Lakes did not disappoint as the wild and rugged character of the basin was breathtaking. 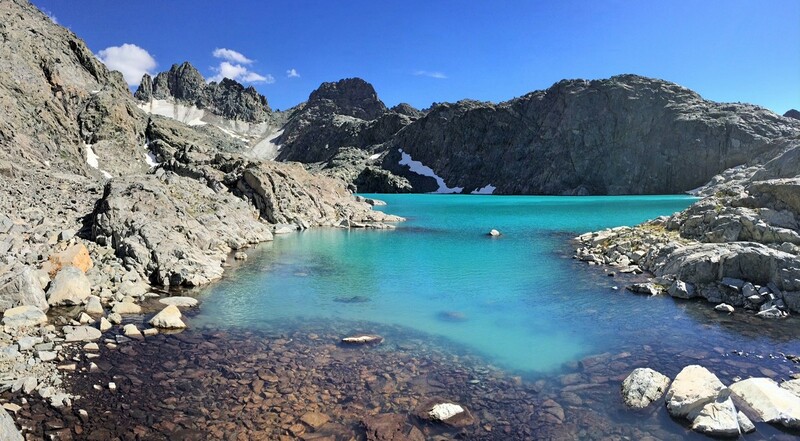 These pristine lakes range in color from sapphire blue to bright turquoise. The uppermost lake beneath Neglected Peak is strikingly turquoise. From the Ritter Lakes I traversed to Lake Catherine which had excellent late afternoon light and then headed over North Glacier Pass and down to Thousand Island Lake for a pleasant early evening stroll along the entire length of the lakes north shore. I completed the loop by taking the River Trail bac to Agnew Meadows. Awesome photos! I just finished the JMT and am planning a trip back to this area. I would love to hit a loop like this! Gosh what stunning photos! So amazinf!